Direct Action, by Luke Hauser. Thirty years ago today a handful of us nonviolently blocked the South Gate of Lawrence Livermore National Laboratory (LLNL), a top-secret nuclear weapons lab in Northern California. Most of us were sentenced to a week in the local county jail. It was my first arrest. Though LLNL successfully fended off years of mounting opposition—it continues to operate to this day—a surge of global anti-nuclear resistance in those years created the conditions for the Comprehensive Test Ban Treaty (which 157 nations have signed) and a string of arms control agreements. Our little action, organized by the Livermore Action Group (LAG), was a modest contribution to that groundswell. As the Occupy movement gears up for its second wave—and as people from around the world ready themselves to protest the NATO and G8 summits in Chicago in May—my thoughts turn to that winter morning three decades ago when another movement was beginning to gain traction and when I, who had stood at the water’s edge for some time, gingerly waded in. While civil disobedience is only one of many tools with which to make social change, it was this particular practice that quite rapidly introduced me to a way of being that, to me, was a foreign but increasingly meaningful path with its own language, lineage, set of expectations, and peculiar ability to be taken seriously under the right conditions. 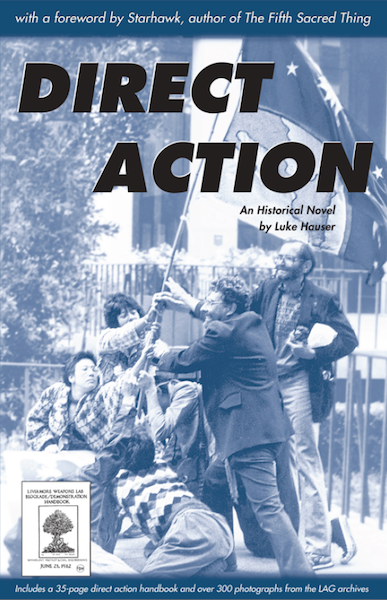 In his novel Direct Action, Luke Hauser captures the heady intensity of Livermore Action Group from 1982 to 1984, when it organized dozens of actions and built a network of nuclear resisters organized in hundreds of affinity groups throughout Northern California. Livermore Action Group was part of a planetary network in the early 1980s that created a new wave of the global anti-nuclear movement employing nonviolent direct action and civil disobedience, including indigenous communities, women’s communities (e.g., Greenham Common Peace Camp maintained for years at the edge of a U.S. air base in Britain), Greenpeace, The Freeze, SANE, CND, American Peace Test, Abolition 2000, Atomic Veterans and the Nevada Desert Experience. With roots in the women’s movement, the anti-war movement and the civil rights movement, LAG in turn nourished the U.S. Central America peace movement, the LGBTQ movements, the disability rights movement, the anti-globalization movement and many others. After the civil disobedience action on March 1, 1982, I joined Spirit Affinity Group. My life was changed irrevocably by this circle of passionate and wise people—Terry Messman, Darla Rucker, Sandee Yarlott, Ron Stief, Kathy (later, T’Shala) Vahsen, Bruce Turner, Jim Bridges, Bob Russell, Pat Runo and the late Rick Cotten—as most of us, like the characters in Hauser’s book, lived the life of nonviolent resistance full on for those few, intense years. Against the backdrop of the times—the accelerating arms race, the total war of so-called low intensity conflict and the bitter sting of Reaganomics— we created or participated in a string of actions for change. We joined the flotilla of rowboats that Shelley and Jim Douglass organized to nonviolently confront the first Trident submarine in the waters of Puget Sound in the summer of 1982; we chained ourselves to a 25-foot mockup of the MX missile in the roadway at LLNL; and we repeatedly occupied the offices of the Salvadoran consulate in San Francisco to engage the U.S.-backed wars in Central America. In June 1983, we joined 1,100 others who were arrested at LLNL as part of the International Day of Resistance. We were held for two weeks in makeshift tents on the grounds of the county jail as most of us stayed put rather than submit to a sentence of two years probation, which likely would have severely undermined the local anti-nuclear movement. The authorities finally relented on this issue, and we were brought to endless rounds of arraignments in groups of fifty. Hauser’s novel recreates the emotional and political milieu of the anti-nuclear blockades at Livermore Lab, Vandenberg Air Force Base, and the San Francisco Financial District. The nonviolent direct actions of the 70s and early 80s against nuclear power and nuclear weapons were the forerunner of a style of organizing that came to fruition in the blockade of the World Trade Organization in Seattle in 1999. Many of the assumptions about nonhierarchical organizing, and many of the tactics and strategies that inform the global justice movement today were pioneered at that time. As we take the next step in this global justice system—including the 99% Spring and its call for 100,000 people to be trained in April in nonviolent direct action—we recall a few of the roots of the contemporary emerging worldwide movement, even as we have the opportunity to build something more powerful and enduring. Thanks Ken for reminding us of the powerful movement of the eighties which have nourished the seeds in many of us for the Occupy movement today. We ARE ON THE ROAD TO FREEDOM and JUSTICE and We Shall Overcome!